Who ​turned the TV on? All rooms have a bathroom and colour TV. I watched the film on TV. He’s the top TV presenter for children’s programmes. ▪ television/TV noun [uncountable and countable] the piece of electronic equipment shaped like a box on which you can watch programmes, or the programmes that are broadcast using this. In everyday English, people usually say TV: Sometimes I don’t feel like doing anything except watching television. | A lot of people use the Internet for watching TV. | Can you turn on the television? | the TV Guide in the newspaper | There's nothing good on the TV. | Our TV set (=television)isn't working properly. 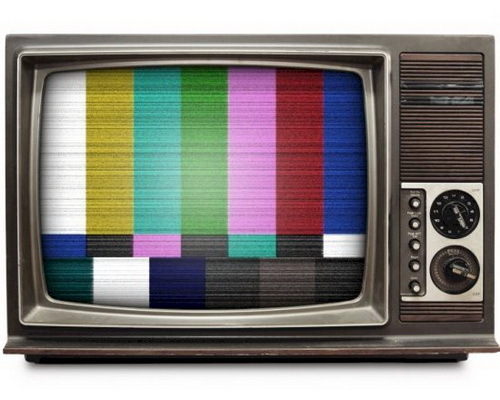 ▪ the box/the telly British English (also the tube American English) noun [singular] informal a television, or the programmes that are broadcast on television: Can you turn the telly down a bit? | What’s on the box tonight? | There's nothing good on the tube. ▪ terrestrial television television that is not broadcast by satellite or cable: The company has secured the rights to broadcast the Championship on terrestrial television. ▪ cable television (also cable TV, cable) noun [uncountable] television programmes that are broadcast by ↑cable (=tubes containing wires that carry television pictures): The program was first shown on cable. ▪ digital television (also digital TV, digital) noun [uncountable] programmes that are broadcast using ↑digital signals, with more choice and better quality pictures than ordinary television: The switchover to digital TV will take place between 2010 and 2012. ▪ widescreen television (also widescreen TV) noun [countable] a television that is much wider than it is high, and wider than an ordinary television. Widescreen televisions are used for programmes that are broadcast using ↑digital signals: There was a massive widescreen TV in the living room. | Widescreen TV is good for watching films. ▪ What's on TV tonight? ▪ watch television Mum was in the lounge watching television. ▪ see/watch something on television She saw the race on television. ▪ turn/switch the television on/off I switched off the television and went to bed. ▪ turn the television up/down (=make it louder or quieter) Rory had turned the television up so loud that the people next door complained. ▪ a television show/programme Her favourite television programme was just starting. ▪ a television series (=a set of programmes with the same characters or subject, broadcast every day or every week) He starred in the popular television series, ‘Friends’. ▪ a television film/movie (=a film that has been made to be shown on television, not in a cinema) Ford appeared in several television movies. ▪ the television news There was nothing about it on the television news. ▪ a television screen Bella’s eyes were fixed on the television screen. ▪ a television reporter/journalist Grant was interviewed by a BBC television journalist. ▪ a television director He’s a very successful television director. ▪ a television (film) crew A television crew were allowed to film the meeting. ▪ a television actor/actress Peebles is best known as a television actor. ▪ live television The accident was shown on live television. ▪ national television The President went on national television to appeal for calm. ▪ satellite/cable television They have a dish for satellite television. ▪ terrestrial television British English (=television that is not broadcast using a satellite or cable) Many of these matches are not available on terrestrial television. ▪ a widescreen television Widescreen televisions are getting more popular, especially in home cinema systems. ▪ a plasma/LCD television Each hotel room has a minibar and plasma television. ▪ a black-and-white television They had an old black and white television in the garage. ► Do not say 'see/watch something in television'. Say see/watch something on television. • We're buying a new TV with the money. • Almost all homes have at least one TV set. • All rooms have a bathroom and colour TV. • She's a highly paid TV presenter. • We don't do much in the evenings except watch television. • I'd like to work in television (= for a television company). early 20th cent. : from tele- ‘at a distance’ + vision. • Millions watched the events on live television. • She recalled her first television appearance forty years ago. • She works in television. • The Olympics receive extensive television coverage. • The children watched television for most of the evening. • The state television screened pictures of the trial. • The trial was broadcast by local television. • We were watching the news on television. We ate in front of (= while watching) the TV. Could you turn the television down? It's one of the few television programmes that I always make a point of watching. Is there anything interesting on television tonight? Clare has worked in television since she left college. Your problem is that you watch too much television. TV means the same as television. I prefer going to the cinema to watching TV. • We need a new TV. • Do you want to watch some TV before bed? • She works in TV. • There's nothing (good) on TV [=on television] tonight.